The happening with thousands of fans chanting ‘Park JaeBum’ during 2PM’s performance on Dream Concert has garnered much interests. 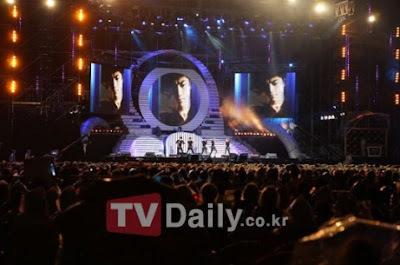 2PM performed the 2 songs ‘Don’t Stop Can’t Stop’ and ‘Without U’ off their 3rd single album on 2010 Dream Concert which took place on 22nd May at the Seoul World Cup Stadium. From the start till the end of the group’s performance, fans including those from other groups, had come together to chant for the group’s ex-leader Park JaeBum. With the fans’ loud chants throughout the performance, the 2PM members had seemed a little flustered. Accounts from some of the audiences, “Even though it’s not like I don’t know how the fans feel but this is a little too much”, “They didn’t think of how the 2PM members would feel” etc. Meanwhile, member JunSu was not present for the performance due to his knee injury. He had complained of pain at his knees during their performance on KBS Music Bank earlier on Friday, and he was sent to the hospital where he was treated.